1.In a medium saucepan, cook shredded chicken, barbecue sauce, and diced green chiles over medium heat until heated through. 2.Coat one side of each tortilla with cooking spray. Place tortillas, sprayed sides down, on cutting board or waxed paper. Sprinkle 1/4 cup of the cheese over half of each tortilla. Top evenly with shredded chicken mixture. Fold tortillas in half, pressing gently. 3.Heat a large nonstick skillet over medium heat. Cook quesadillas, two at a time, in hot skillet over medium heat for 4 to 6 minutes or until light brown, turning once. Remove quesadillas from skillet; place on a baking sheet. Keep warm in a 300 degree F oven. Repeat with remaining quesadillas. 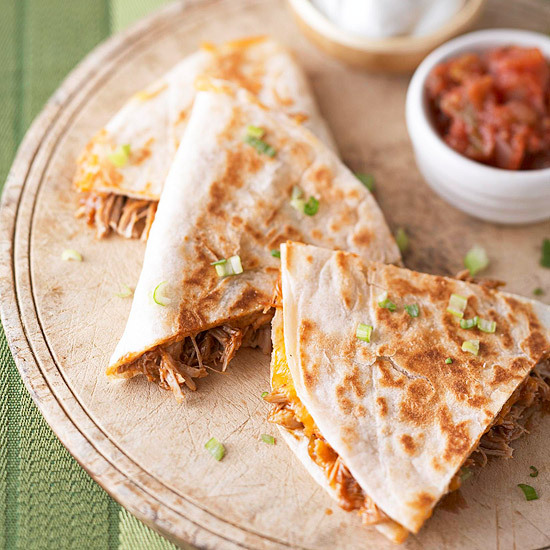 To serve, cut each quesadilla into three wedges. Serve with salsa, sour cream, and green onion. Makes 4 servings. Directions1.Place chicken thighs in a 4- to 5-quart slow cooker. For bouquet garni, cut an 8-inch square from a double thickness of 100 percent cotton cheesecloth. Place thyme, parsley, bay leaves, garlic, and peppercorns in the center of the cheesecloth. Bring up corners of the cheesecloth and tie with 100 percent cotton kitchen string. Add bouquet garni to slow cooker. Pour chicken broth over all. Cover and cook on low-heat setting for 7 to 8 hours or on high-heat setting for 3-1/2 to 4 hours. Remove bouquet garni and discard. Using a slotted spoon, transfer chicken to a large bowl. When chicken is cool enough to handle, remove meat from bones. Using two forks, shred meat. Add enough of the cooking juices to moisten meat. Strain and reserve cooking juices to use for chicken stock. Place 2-cup portions of chicken and chicken stock in separate airtight containers and refrigerate for up to 3 days or freeze for up to 3 months. Makes 6 cups.